News from Camper & Nicholsons that they’ve listed for sale the 74.3 metre classic motoryacht Williamsburg. Williamsburg was built in 1930 by Bath Iron Works for the American paper magnate Hugh J. Chisolm under the name Aras II. She went on to serve the US military as a Patrol Gunboat (PG-56) in 1941, becoming the USS Williamsburg. After serving in WWII, the motoryacht was converted into a presidential yacht for President Harry S. Truman. She hosted guests as prestigious as Winston Churchill and was nicknamed the ‘sea-going White House’. Unfortunately, after serving a variety of owners and purposes, she fell into neglect in an Italian shipyard. Willamsburg is now being listed as a restoration project to be completed in 2017. She is looking for an ambitious owner who is looking to return her to her former grandeur. She features 12 guest cabins and accommodation for 16 crew. Constructed out of steel, she boasts an 11 metre beam. With twin 2.700hp CAT engines, she has a top speed of 15 knots. 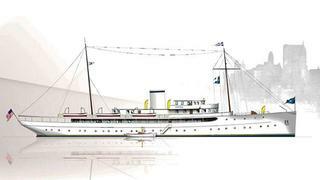 This historic luxury yacht is asking $55,500,000. A detailed refit project summary is available from Camper & Nicholsons on request.